What To Do About Dog Food? First, Let Go Of The Guilt! Have a giant breed puppy? Download your FREE Quick Start Guide to Feeding Giant Breed Puppies here. Concerned dog owners are bombarded daily with messages about dog food. So what is the answer? What is a dog owner to do in this confusing, guilt-ridden doggie-diet space? I hesitate to call this dog food other than the fact that you are feeding it to your dog. Raw can range from a commercial raw diet like Primal Raw (which I mentioned in The Labrador Retriever May Hold Answers To Feeding Woes In Big Dogs), Raw Paws Pet Food, and Darwin’s Pet Food, to whole raw meat, bones and organs (fed in a ratio of 80:10:10). Some raw feeders are very strict and don’t feed anything else, while others will add fruits, vegetables, and other grains as well. Sulley was raw fed from 10 weeks until he was 2 years old. I loved feeding raw. Sulley LOVED me feeding raw! Some people are grossed out by it. I loved that I was preparing his food and knew exactly what he was eating. And I strangely enjoyed watching him eat. It was like watching a wolf eat its prey only with enormous jowls and profuse slobber. Feeding Sulley raw was a transition from fancy packaging and mystery ingredients to 50 pound cases of beef hearts and turkey necks. At about 18 months old, Sulley started getting constant ear infections. Constant. Despite regular cleaning, antibiotics, and ear solutions, Sulley was plagued with inflammation, gunk, and fluid in his ears. He would pace our bedroom at night shaking his head unsuccessfully trying to get the fluid out. My vet suggested doing a food trial by taking Sulley off raw and putting him on a limited ingredient prescription dog food. I opted not to do that as I am not a fan of prescription diets and did not want to take him off raw. Instead I did my own food trial. I started by eliminating chicken as chicken is very commonly the culprit in food allergies in dogs. Almost immediately, Sulley’s ear infections cleared up and his ears have been clean ever since. A blessing…sort of. Without chicken, a raw dog food diet can be costly if you are not able to find local sources of meat economically. At that time, I reluctantly decided to switch him to a commercial dog food, Zignature. A decent dog food, but a decision that brought with it tremendous guilt for not doing more for my sweet Sulley. I am not going to go through the plethora of commercial dog foods out there. There are too many to count and, quite honestly, I’m not sure there is that much that separates them from one another. They all use the same basic method of manufacturing and processing the kibble so that it is shelf-stable. I have fed my dogs everything from Orijen, Fromm, Natural Balance, Zignature, and Solid Gold, to, yes, I am going to admit it, the devil itself, Dog Chow. Gasp! Now that I have put myself out there so vulnerably, I might as well go all in. I fed Dog Chow not that long ago, and AFTER feeding Sulley a 100% raw diet for two years. Double GASP! Why, oh why would I stoop to the bottom of the barrel like that? How could I, an educated, professional woman who actually had a business selling holistic dog food before holistic was even a thing, inflict such abuse on my poor dog? Seems like an inexplicable choice given the plethora of other commercial dog food options. Zignature Zssential Formula Dog Food, 27 Lb. When Junior came home at 10 weeks old I switched him to raw. I prepared Junior’s raw dog food exactly as I had prepared Sulley’s raw food two years before. But within two weeks I started to notice alarming changes to Junior’s hind legs. He seemed painful at times and his structure and movement were off. Really off. I consulted his breeder and my veterinarian and the three of us agreed to switch him back to a commercial dog food and observe him over the next few weeks. Enter the devil. Dog Chow. 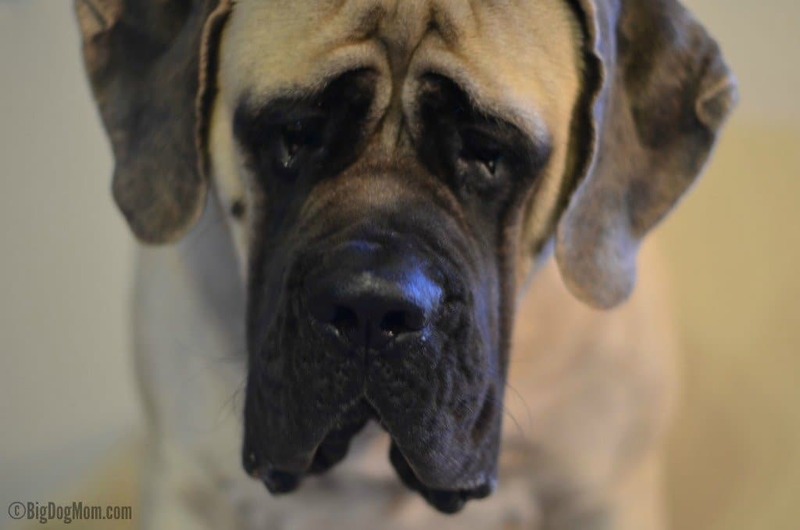 I consulted several experts in the Mastiff breed whom I trust and they almost unanimously recommended Dog Chow. “You want as low a protein dog food as you can find in order to slow the puppy’s growth down,” they all said. I was so worried about Junior that I would have agreed to boil chicken for three squares a day if I thought it would help my baby. Feeding Dog Chow, while putting my gag reflex to the test, was within the bounds of reason to make Junior better. It is no exaggeration when I say that Junior improved almost immediately. By day two on kibble, Junior was back to being his playful, crazy self. And within a week, his hind legs were completely back to normal. The Dog Chow worked. Don’t forget! Download your FREE Quick Start Guide to Feeding Giant Breed Puppies here. Bring on more guilt. Guilt for feeding Dog Chow. Guilt for causing Junior’s issues in the first place. To this day I do not know what exactly caused Junior’s deformity and pain for those two weeks. Too much bone? Too little muscle meat? Excess liver? Or could it have been an extreme case of Panosteitis and not attributed to his diet at all? I will never know with certainty. So what are Sulley and Junior eating today? Right now, they are getting both; about 50-75% commercial dog food (Fromm Family Foods) and 25-50% raw. The raw component has ranged from Primal Raw to raw chicken (for Junior), duck necks, liver, tripe, eggs and any other raw meat I am preparing for my family that day. In addition to the meat and kibble, I add coconut oil, fish oil, NWC Naturals Probiotic and Enzyme Powders, and Vitamin c powder. I don’t do all of these supplements everyday. They are varied each day so that over time both dogs get what they need. While raw feeding purists will argue against my feeding regimen, my perspective is that some raw is better than no raw for Sulley and Junior. How ironic is it that a woman who drinks too much Diet Coke, loves salty foods, and bakes bread with extra gluten would lose sleep over what to feed her dogs? There is only one explanation for this inexplicable irony. I love my dogs. I believe the care I provide Sulley and Junior should be commensurate with the unconditional love they give me. That is a tall order and one that keeps me up at night. © 2019 Big Dog Mom, LLC. 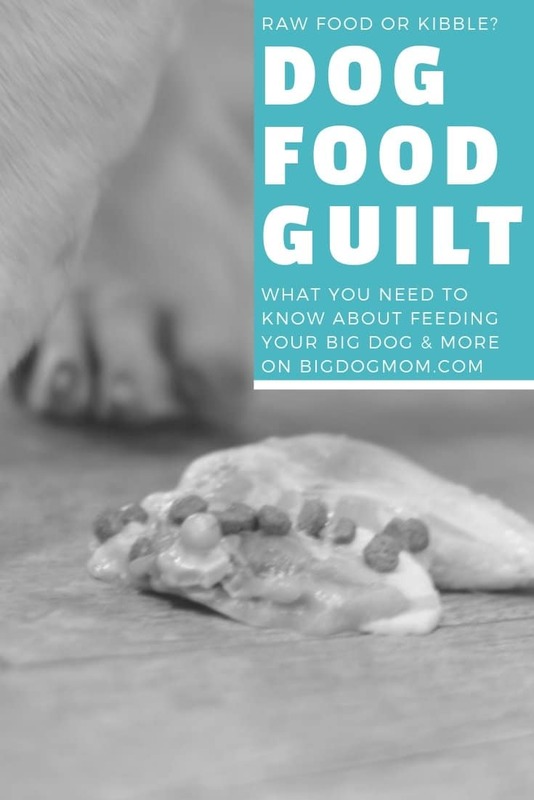 So, right here, right now, I want to you (and me) to let go of the guilt about dog food. I am here to say kudos to you for the wonderful dog mom or dad that you are. The fact that you made it to the end of this post PROVES you love and care about your big dog’s health and wellness. If you didn’t you wouldn’t have made it past the title. My goal here today is not to change your mind if you feed kibble. Or to scare you if you feed raw. Heck, I feed both so I guess that makes me a bit like Switzerland at the moment. My goal is to let you know that you are not alone. Pay attention to your dog, how he looks, and how he is feeling. Be knowledgeable about the dog food choice you make and why. Be flexible and open minded. And, most importantly, get some sleep. I love the honesty of this post. It’s obvious you are passionate about feeding raw, but you also love your dogs enough to feed them what’s best for them. I have this situation with Truffle and Brulee. Brulee prefers kibble and only one type of kibble. I try to feed her a high quality wet food but she’ll take a few bites and go back to the kibble. She’s doing well with it, so I’m feeding her what works for her. Thank you so much! Whether it’s raw or commercial kibble, if the dog or cat won’t eat it, then it’s probably not the best diet for them. Good luck with Truffle and Brulee! Thanks for sharing your experience. While commercial foods are not the best choice for many dogs, for others they do provide excellent nutrition–since, as we know, every dog (and food!) is different. I’m not a veterinary nutritionist, and don’t feed myself all that well, LOL! so I do rely on the expertise of those in the business of balancing foods. For me, choosing the highest quality commercial food I can find works, along with offering home cooked ingredients (veggies, meat, fruit) from my own table. Thank you, Amy. I am hopeful what I conveyed in this post was really the freedom for everyone to, without guilt, choose the best diet they can for their dogs. If that’s a high quality commercial food for you, great. If I am ever able to get both of mine back on raw, fantastic. But at the end of the day, we are doing what we feel is best for our best friends, and that is what matters. Thanks for sharing! I agree that at the end of the day, you need to just know that you’re doing the best you can for your dog, whatever that means to you. Feeding, like many things, can be a very personal journey. We feed our dogs raw, but we have not always done so. Heck, when we got Boomer as a puppy, she was fed Pedigree and Iams. I know, I know.. like I said, it’s a journey! I think it’s important that we share quality information so that dog owners can make informed decisions for their pets. Then it’s up to the owner’s best judgement and budget. I completely agree, Debra! Future posts will focus more on raw because that is where I am in my journey. I have a lot of experience with it and know there is a great deal of opportunity for more education for dog owners who are considering a raw diet. Boomer eating Pedigree is akin to Junior eating Dog Chow. I’m with you. We are all on this journey together. My hope is dog owners will feel a little less guilt along the way. Thank you so much, Cara!! I’m glad I’m not the only one who stresses over this. But Boxers are decent size too so I’m sure you feel the same struggle as I do with how much food we have to feed. Like you, I have tried so many foods with Ruby and I think a combination is best. We do have her on a food we like right now, but I also incorporate some raw and other foods as well. And yes, the guilt is a challenge. P.S. : I love diet coke and salty foods, too! Haha! Thank you so much! Always love a fellow Diet Coke drinker too! I fed my dogs stuff way back that I would never touch now, and I have felt guilt when they got sick and it could have been related. They now eat Primal and are doing very well. I just keep looking ahead, not back. Interestingly, some of the world’s longest living dogs were on raw food and some were on kibble. I think it’s all more complicated than that. Though I do feed raw because I do believe that whole foods are better. I agree, Jana, that this issue is more complicated than a matter of choosing raw or kibble. I do prefer to feed raw as well and like to think the more species appropriate diet would, in part, contribute to better health and longevity. Glad you’ve sorted out the best way to feed your babies without feeling like you’ve shortchanged them. And it certainly is something to think about how we sometimes worry more about what goes into our pets than ourselves (and in my case, my human kids). I think the best we can do for our pets is educate ourselves about what we’re giving them. Thankfully, we have lots of food options! You are absolutely right, Elizabeth! What a blessing we have as many options as we do today and the freedom to make those decisions for our pets. Thanks for sharing your dog food journey! I think that too often people criticize each other’s choices instead of respecting them. As pet parents, we all try to make the best choices for our dogs, and what works for one person (or dog) might not work for another. I’m glad you let go of the guilt and your dogs are healthy and happy! We are currently feeding Vino and Karma Fromm, and it seems to work wonders! Vino has a serious sensitive tummy issue, and finding the right food for him was hard. I will say, I always try to find the best I can for my dogs within my capabilities, and I never feel guilty about that. That’s wonderful, Shayla! I’m so happy you found a food that you can feel good about and that works for your pets! Thanks to our vet we switched to a grain-free diet because of an (at the time) unspecified allergy and we’re on it ever since. My JRT Kala’s digestion is great and she got a bit slimmer although we haven’t changed the amount of food or the amount of exercise. After doing some extensive research I opted to combine different foods just like you. Currently, we’re doing a combination of home-cooked meat and vegetables and dry kibble and she’s feeling great. Thank you, Anna! That is wonderful that you found a balance that works great for Kala. It’s not easy sometimes, especially if you have allergy issues.